semi cold shoulder top with garter strap in 5/8th sleeves with grommet and string details in spot print flora poly fabric The Wylei cold shoulder top comes with a colorful floral print and string details at the sleeves to adjust freely. Take this top to your casual days. Printed satin romper with side tie detail Stay comfy and chic with the Vortimer playsuit, featuring a colorful print painted on a satin canvas for a sophisticated elegant appeal. 2 in 1 pantsuit with inner top. Designed to be converted to a pair of culottes.Show off your edgy urban style with the Vong pantsuit, designed to be converted into more than one outfit. Layered over an inner piece for versatility in your wardrobe. Have your own fashion fairytale moment with the Vlad long sleeves top, painted with an elegant floral print and a timeless wrap around detail to show off your feminine style. 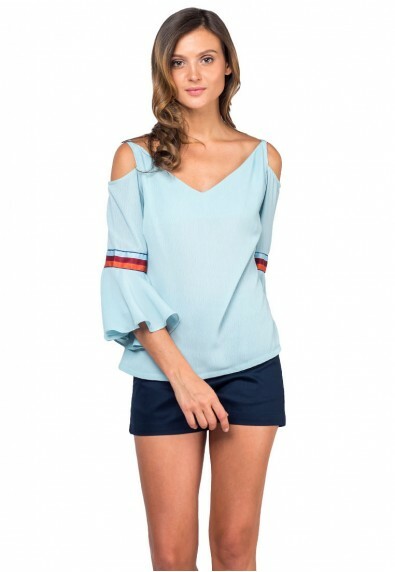 Plain off-the-shoulder top with knotted sleeves design Embrace your feminine side with the Vivianne offshoulder top. This piece features a knotted sleeves design for a playful charm and elegant style. Flared and layered skort in red Cute and charming, this Viva skort is a flared and layered bottom accentuating the figure and amplifying your feminine style. Wide neck top with bell sleeves design Take this fashion staple from work to weekend wear. The Veshpa long sleeves top includes a bell sleeve design to show off your qwirky elegant style. Off-the-shoulder suede shirt with long sleeves Add a little pizzazz to your urban style with the suede Venzo offshoulder top. Pair it off with a skirt or jeans to dress up or dress down with, both still giving you that fashion forward personality.